A decade into the Pentagon’s efforts to curb sexual assault in the ranks, officials say they’re having an effect — and if anything, are oversaturating troops with certain prevention messages. It’s time to develop better, more tailored training, leaders of the Sexual Assault Prevention and Response Office said at the release of their annual report. In 2017, 6,769 servicemembers reported being the victim of a sexual assault, though a tenth of those incidents occurred before they joined the military. That marks an increase in reports of nearly 10 percent over the previous year. The Pentagon says that’s a good thing, that it indicates that troops believe something will come of stepping forward. “We view this willingness to report as the result of a decade-long effort to improve victim support, criminal investigation and military justice,” SAPRO chief Rear Adm. Ann Burkhardt said on Monday. The other possible explanation for more reports — that there were more victims — can’t be discounted, because the Pentagon only conducts a survey to estimate the prevalence of sexual assault every other year; 2017 was not one of those years. 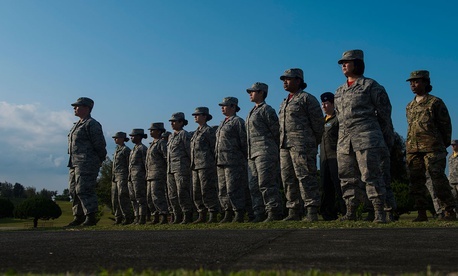 The 2016 report estimated that sexual assault in the ranks had dropped by more than half since they started looking at it in 2006. But after a decade of working on this, SAPRO leaders said it’s time to upgrade and update some of their efforts. While conducting more than 50 focus groups with junior and senior enlisted members and officers, SAPRO heard that there was some “training fatigue,” said Ashlea Klahr, who directs health resilience research for the Office of People Analytics. Not only does that endanger the office’s prevention efforts as a whole, it’s also an indication that individuals aren’t getting what they need. Troops want training that “grows with them” over their careers, not just the same messages reiterated again and again. SAPRO’s website lists several training programs, including a pre-command course, an annual refresher, and ones for pre- and post-deployment. But SAPRO’s deputy director, Nathan Galbreath, said it’s time to get “a little bit more strategic” with their approach.